PREMIUM HIGH QUALITY PAPER AND FULL COLOUR- No More Ripped Sheets or Show Through Writing. Our A6 GymPad Mini Offers a Full Color Layout With Water Resistant Front and Back Covers. 100% MONEY BACK GUARANTEE – If For Whatever Reason You Want To Return Your GymPad Mini. Just Return It, and We Will Refund Every Penny or Replace It If There Is A Problem. 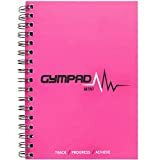 GymPad Mini – the brand new fitness journal which offers you 100 workout templates to track your resistance and cardio training in the gym to ensure you reach your health and fitness goals. One of the best ways to keep track of your progress is by keeping a workout journal. Logging workouts helps you remember where you began. We all know the secret to success starts by creating a goal. But how will you achieve that goal? ☑Before & After Photo for motivation and progression. ☑100 stylish full colour workout templates designed and created by fitness professionals to give you the best tracking experience. ☑Motivational Quotes at the beginning of all 100 workout templates to give you that extra boost before you begin. ☑Measurements page at the beginning and every 25 workouts to track your progression throughout the journal. ☑Keep track of your day to day life with 2 pages of notes. At GymPad we offer a 100% MONEY BACK GUARANTEE! !